Navneet Gems Is a Supplier of Created Emerald, Straight From Our Manufacturing, at Wholesale Price. The History of Created Emerald, How It Was Discovered and Who Made It First? In 1907, the Ruby and Sapphire creation technique was found by the flame fusion method found by the French chemist ‘Verneuil’ but this method didn’t work on Emerald and later on after a long time, it was the American based chemist Carroll Chatham that developed a technique to create Emerald. Chatham was said to be curious and brilliant from his childhood days. After getting permission from his father, he started working to grow Created Emerald. In 1930, he grew a colorless beryl and later in 1935 he had grown the first EMERALD. The first piece grown is available in the Smithsonian Institution. At first when Verneuil tried to create an Emerald, it didn’t work because it was very difficult to melt all of the components or mineral elements together. Some of them evaporated and at that time others were in the melting stage so there was not a proper melting combination of all component elements together. Later on, Carroll Chatham developed a Flux Recipe to melt all elements together and in the end it worked out and he had grown the Emerald Crystals. 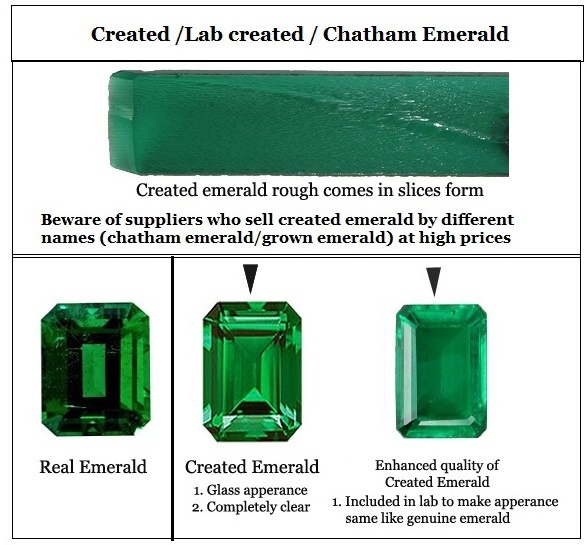 After Mr. Chatham made this stone, many scientists started to experiment and finally a new method of hydrothermal flux synthesis was introduced to create Emerald, and then the manufacturers cut it into cabochons and faceted stones in different sizes. We give a hats off to Sir Chatham to give such an amazing technique to this world. Now many companies have plants to produce Created Emerald. Navneet Gems is manufacturing and supplying created emerald faceted stones in 2mm, 3mm, 4mm, 5mm, 6mm, 7mm, 8mm, 9mm, 10mm and up sizes in rounds, ovals, cushions, trillions and other shapes as well. We make customized stones too as per our customers’ requirements. 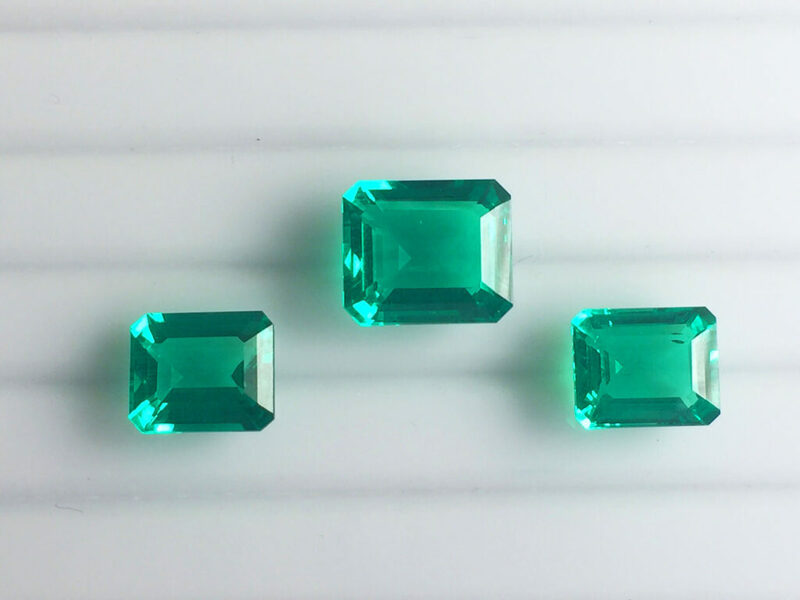 Round and ovals are the most popular shapes in Created Emerald. Mainly Russia and India are producing this material and we use the Russian quality which is far better than Indian. Some customers ask us for light to medium color in Created Emerald and some ask us for medium to dark shade so we have different color and qualities’ slabs to accomplish these requirements for our clients. In some slabs, you can see lab developed inclusion to give it the same appearance as Natural Emerald. Created Emerald is better than the high price tag Natural Emerald in many aspects like color variation and inclusions and big size problems. Our manufacturing is situated in Thailand and both of our factories are producing excellent. 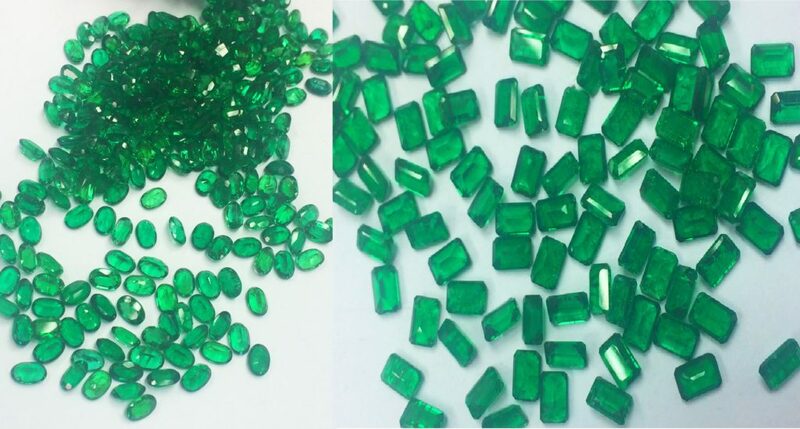 Gradually Created Emerald is replacing Natural Emerald because of high prices, low quality and availability. 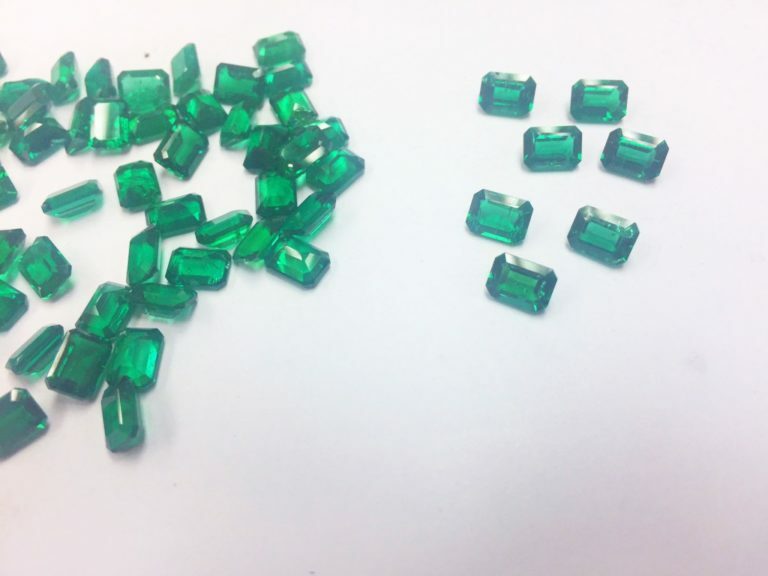 Created Emerald Rough – We have not only been producing and supplying loose Created Emerald in both faceted and cabochons stones but also selling Created Emerald Rough material. It comes in slice form in different heights, varying from 4-5mm to 10-12mm. The most appreciated color is medium green so we sell mostly that quality. When we compare it, then it resembles Natural Columbian Emerald. Please check the pictures below. Quality parameters in it are opposite to Natural Emerald when it comes to checking the inclusions because everyone looks for included quality in Created Emerald and we supply that also. Are Navneet Gems’ Created Emerald cabochons, rough and faceted stones artificial or are they Imitation? Our Created Emeralds are cultured like Pearls. Natural chemicals (minerals) are placed in an environment created in a lab and crystals grow which takes years. The total time depends on lab created conditions and minerals. In the result, crystals grow with identical chemical, physical and optical properties to those mined from mines. We don’t have labs to grow these crystals because of the million dollars in set up costs but we have our good contacts and we buy raw material or slabs of Created Emerald from them. 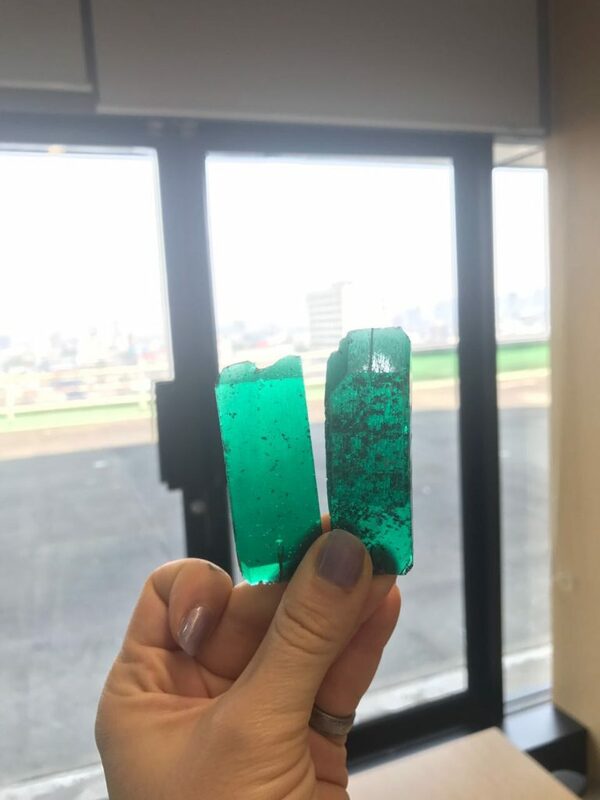 The important thing is that, we don’t have any third person between the laboratory and us, so it minimizes our cost and this way we provide competitive prices and top quality Created Emerald to our customers. Is it easy to tell the difference between Created Gemstones and Mined Gemstones? Created Emerald also comes in different qualities. The top quality of Created Emerald resembles the mined gems on that level, and even gemologists cannot tell the difference without using a powerful microscope. Top Quality Created Emerald comes in the same color, inclusions and clarity level of Natural Emerald. One of our customers asked us, “Can I clean Created Emerald Gemstone like the other Semi Precious and Precious Gems“? It’s very essential to clean gemstones you are wearing to maximize its beauty, luster and brilliance but before that you need to know how you can clean gems. You have heard of many cleaning methods like ultrasonic cleaning, using jewelry cleanser etc. but do you know that all of these methods are not suitable for every type of gemstone? Sometimes lack of knowledge can damage your gemstone or setting. The simplest method that can be implemented on every gem is to take a bowl of warm, soapy water and soak your piece, it takes out the dust and particles then you can use a brush (it should not be metallic) to remove grime and particles. Never use any chemical and rub hard unless it is recommended to you by experts. You can also email us if you have any question regarding gemstone cleaning. Why did the supply of Created Emerald material become low and only few suppliers have it? High demand of this stone made the supply low because Emerald Crystals take time to grow and demand is high so now only a few gemstones suppliers like us, have a consistent supply of this material. We can do so because we have a direct connection to the labs and we buy and hold the big quantities when they come out, for selling. We have been buying Created Emerald Rough from them for many years. Please send us an inquiry on our email through the contact us form and we will reply back you back within few hours. Your queries are appreciated. You can also contact us through calls, Skype, WhatsApp and other instant messengers. See the Contact Us link above or in the footnote below.